Venus Optics made some waves earlier this year with the introduction of their new 60mm F/2.8 2:1 Macro lens. Now the company is back, announcing their latest product: a new twin flash that they say is the world’s most powerful twin flash. The new macro focused lights look like the medusa of speedlights, thanks to the long adjustable arms extending from the top of the unit. This makes lighting for macro shots easier than with a traditional Speedlight or ring light; especially on the Venus 60mm macro lens, which can at times require you to be extremely close to your subject. The new light, just like the macro lens, appears to be very appropriately priced as well, coming in at only $299 on eBay. This appears to be a great compliment to the new Venus 60mm 2:1 macro lens, and could be a great addition to any macro photographer’s kit. You can learn more about the new twin flash over on the Venus website here. If you are interested in picking one up, the fastest way to get one here in the US is via Ebay, processing times run 3-4 weeks if you purchase direct from the Venus website. What are your thoughts on this new Venus TwinFlash? Do you think that you could find a place in your bag for this and your macro imagery? Leave a comment below and let us know what you think! Looks like War of the Worlds – on a micro level of course. I could see some pretty cool images coming from a “little” rig like this. The button layout looks almost exactly like Yongnuo. 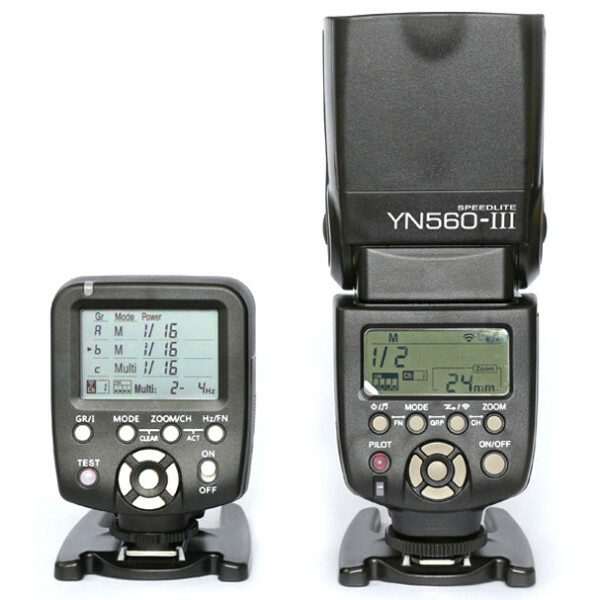 Even the “base” section and screen size is similar to the Yongnuo flash commander shown in the link below…. These Chinese companies make me scratch my head and wonder what all they’ve got going on over there that we don’t know about. It looks like a nice accessory for dedicated macro shooters but with so many 3rd party flashes coming out at such aggressive prices, $300 seems a bit steep. Depending on how much output you need, there are so many options available. Even when you factor in the cost of triggers and mounts, you’ll be able to come under that price and have the bonus of versatility for other forms of off camera flash uses. As much as I might want a dedicated macro flash for more composed macro work, I refuse to pony up the weapons-grade-plutonium pricing for canon’s MT-24EX. So as much as I try to buy first-party gear for reliability and resale, I’ll make an exception here. Can anyone versant with Macro flashes speak to the value of this 3rd party offering? The GN seems absurdly high, and those flexible arms would seem to trump the simple front element pivots of the MT-24EX. The GN is absurdly high, but your relative aperture can sometimes be absurdly small as well at high magnifications. f/45 and f/64 are easy to hit, at least with a unit focus macro lens (with a true IF lens, where you get close focus by reducing the focal length, perhaps not so much). f/90 and smaller isn’t out of the question. Throw in a polarizer or two (for cross-polarization shots), split the power between two heads, and a GN of 190 is suddenly only a coupla inches worth of light. Yes, it’s way overkill for the everyday, but it’s not quite as silly as it seems.